If you're wanting to put down roots or just passing through, please take the time to enjoy the natural beauty and many outdoor recreational opportunities the Historic North Santiam River Canyon has to offer! 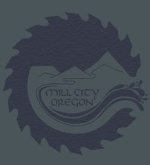 Mill City, founded in 1886, is nestled in Oregon’s scenic North Santiam River Canyon. The city was named after the Santiam Lumbering Company’s mill on the current city site. Mill City was incorporated in 1947, and currently boasts a population of 1,885 residents. Our website, WWW.CI.MILL-CITY.OR.US, is here to serve you! Take a look around and you’ll find information on the city and local area, current news & events, city departments, and ways to contact city staff. Interested in starting Neighborhood Watch in your neighborhood? Contact Councilor Dawn Plotts: dplotts@ci.mill-city.or.us for information. Interested in what is happening in Mill City? Read The Mill City Messenger. To view, go to Documents, then Newsletters or click on the Quick Links on the left side of this page.